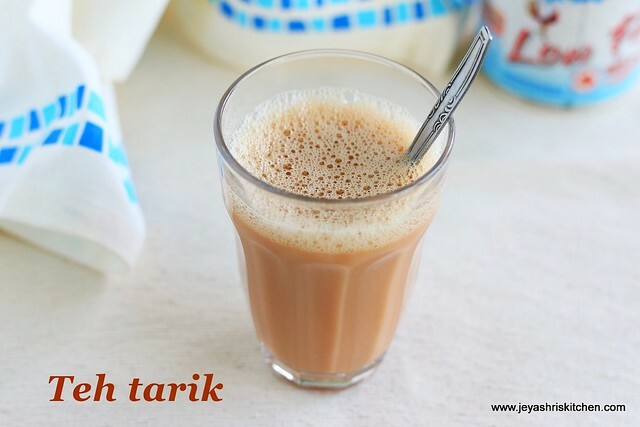 Teh tarik, the term i heard it first when i moved to Singapore. It is nothing but our tea with condensed milk. They don't use milk for making this tea. In the local Kopitiam(cafe) language it is called Teh . This a popular Malaysian beverage. The terms they use for different beverages are quite unique and you should really know the Kopitiam language before placing the order. Though i live here for almost 9 years now, i never visited any local food court Kopitiams. Few years back i had Teh tarik, when we went with a group of friends to toast box, after a morning run. When we were kids, amma used to make tea with milk and whenever we have condensed milk at home, after making some kheers, she will pour some hot water to the tin and add it to the boiling milk tea. This tea will be thick and the taste will be awesome. Those days buying condensed milk is very rare and we will look forward to that too. Very recently, when i accompanied one of our friend to a hospital, after the consultation, we went to the Kopitiam inside the hospital campus. I ordered this Teh and since it was an open kitchen, saw the guy making the tea. He made it in 2 minutes and it really tasted very nice. I had a tin of condensed milk at home and tried it this morning. I could say it tasted so perfect to the one served in the cafe. When you plan to make any payasam recipe using condensed milk, try out this teh at home. In traditional teh tarik, after adding all the ingredients they will bring it to froth, which they call pulled tea. But i haven't seen that here in Singapore,but feel free to froth it up if you wish that way. *adjust the measurement according to your preference. In a saucepan add 1 cup of water and add the tea dust. I use tata gold tea. Though i put 3/4 tblsp, i feel 1/2 tblsp is enough for 2 people. Adjust the measurement as per your taste and how strong you want your tea. After 2 minutes switch off the flame and filter it. In a serving glass add the condensed milk and pour in a portion of the tea decoction. I added 1/4 cup, add little more if you want even more strong. The hot water which you are adding in the last will give hotness to the tea,so make it very hot. If you want to serve for diabetic people add evaporated milk. You can add 2-3 tblsp of evaporated milk as it will be little thinner. I am not sure whether you will get evaporated milk in India. Anyone knows please post in the comments section. This can be adopted during travel too. We used to prepare simple food during travel.